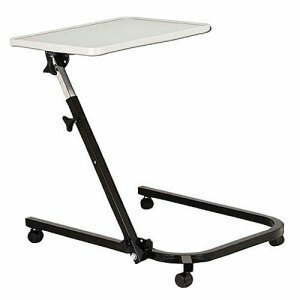 Pivot and Tilt Adjustable Overbed Table Tray . The Drive Medical Deluxe pivot and tilt overbed table is designed to meet the needs of many different users. The adjustable pivot and tilt arm allows this overbed table to be height, angle and tilt adjusted providing a versatile table with the ability to be used in many different applications. The table top is easy to clean, features a stylish grey finish and raised outer lining to prevent items from sliding off. The frames U base and pivot arm allows wheelchair users to position the table top within comfortable reach compared to traditional overbed tables. The mast of the table pivots, and it can lock flat on the floor or at 90 degrees ensuring a flat table surface no matter the mast's positions. Four 2" casters allow for easy transportation, with two locking safely into place for security and stability. 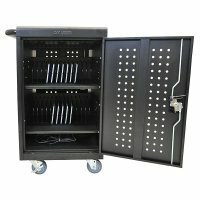 This overbed table folds flat for easy storage in tight spaces when not in use. This product is protected by a limited lifetime warranty. Tabletop (Height): 28"-37"; Tabletop (Width): 23.5"; Tabletop (Depth): 15.75; Base (Width): 25"; Base (Depth): 25"; Product Weight: 21 lbs.